China Tech Giant Sidelined, US Imports Held Amid Trade Spat - Integration Through Media ....! (VOA): A Chinese tech giant has been brought to its knees. Tougher inspections at Chinese ports are holding up cars, apples and lumber imported from the U.S. These are among the early signs that the widening trade dispute between China and the U.S. is exacting a toll on both sides. More talks aimed at resolving the conflict are planned for next week in Washington, while both sides dig in for a fight over their trade imbalance. The tech giant, telecommunications equipment and smartphone maker ZTE, said Wednesday that it's ceasing “major operations” after the U.S. last month banned it from doing business with American suppliers for seven years as a punishment for illegal exports. The ZTE business ban stems from a case dating to before the Trump administration, but analysts say the outcome was worse than expected, reflecting a deterioration in trade relations as the two countries vie for technological dominance. The U.S. Commerce Department's ban cut off ZTE's access to vital technology and components like semiconductors from U.S. suppliers. ZTE said in a statement that is has enough cash and will seek to fulfill its contracts. It was unclear if the company is planning to shut down: Last week during trade talks in Beijing, Chinese officials appealed to their U.S. counterparts to end the ban. But in another sign of fallout, Australian telecom company Telstra said Thursday it will stop selling the company's mobile phones and broadband devices because of the U.S. ban. “This was a difficult but necessary step,” Telstra's head of innovation and strategy, Michele Garra, wrote in a blog post . ZTE sells smartphones globally and supplies networks or equipment to some of the world's biggest telecoms companies. At the same time, U.S. companies exporting to China are seeing their goods held up at China's ports. Customs officials are doing stricter inspections of the emissions systems in Ford vehicles, ostensibly to comply with new regulations. 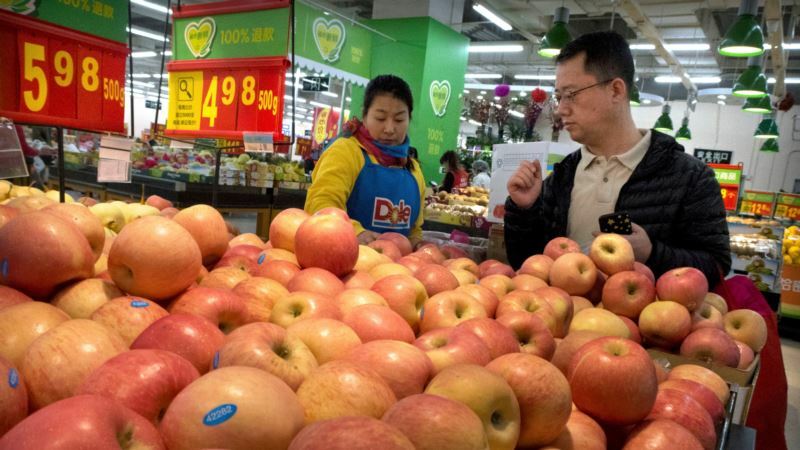 Chinese customs officials said Monday they were tightening up quarantine inspections of apples and lumber imported from the U.S. for signs of rot, pests or diseases. Inspectors in Shanghai, Shenzhen, Qingdao and Xiamen will send samples for lab testing and shipments will not be able to pass through customs while the tests are carried out. Any contaminated shipments will be returned or destroyed, according to the notice posted on China's General Administration of Customs website.